I understand the feeling. We know that the Devil is busy and he does not want to see us happy. I know that I may not have the right words but I know that God does. Sometimes we have to go through some things to make us stronger. Please remember that Dustin’s life was not in vain. With his life he saved others. I try to remember that God has a better plan, and that keeps my head just above water. The Devil feeds on our sadness and anger try not to let him win, remember that God is fighting for us and does not loose. My friend is dealing, she finds herself praying a whole lot more. The only good thing I suppose is that awareness about bulling. The school where he attended has a new music program dedicated to keeping children positive in his behalf. I try my best to check on her every day, sometimes I fall short. Patti just know that it will get better and God will carry you through and you and Dustin will be reunited in God’s time. 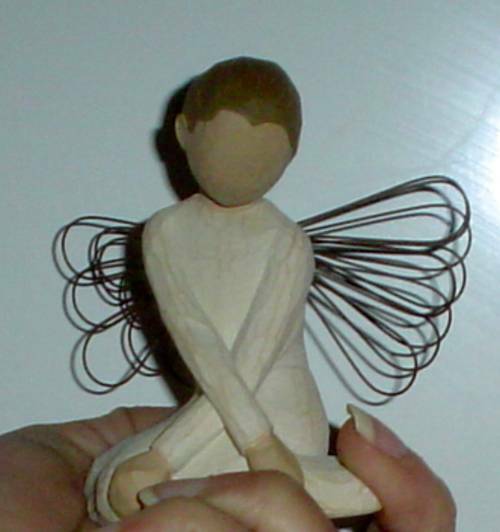 I received this little Serenity Angel from my Cousin Dee in Dallas(area) adn as you can see very unusual. So I read the story behind the creations of these little angels. I have added the link here so you also can read it. The place where you of being angry is okay. I understand your anger. I was angry for a longtime. I prayed and prayed for a week and Kenny died. I knowhow it feels to go backwards. I barely read anything, because most of the things you read are from a clinical point of view. I like to read live experience, it helps me to know someone know how I feel. I am here for you if need to talk to someone. Thank God inspite of ,you made it through another day. You are right a lot of parents don't understand if they haven't been through losing a child. It's nothing none of us want to prepare for. I never thought I would be in the statics at age 35 burying a child. I know my job is a never ending one. Everyday a parent will lose a child as we have. We know the pain they have to endure. I want to reach out to help as many parents that I can. I would love to travel all over the world to let the world know how bad it hurts to lose a child, since I can't right now I will communicate to as many parents over the internet, and through my book. You know the Titled of my book "A Silent Scream" came from me screaming silently and no-one heard me. You know there were times I didn't know who I was or where I was going or how I was going to get there. I felt I was in a zone that no-one knew about about me. Sometimes I would crawl up on the chair with a blanket and cry myself to sleep. Crying helped me. I cried so much, so much I didn't understand so much I still don't understand. It's been seventeen years and sometimes it feels like yesterday. We can only take it one minute at a time. One day at a time is to much. Remember you are not a burden. Thank for sharing your story with me. It is very painful to lose a child. I know, and it is a road. . .Not a easy smooth road but one filled with pot holes and weird stuff. God will carry you. I always try to remember that the real sin is not having faith. I know that may seem lame, but if I don’t have faith in God then its like I don’t believe in him or his works. Knowing that the only way God is described is as being LOVE, and since we were all made in his image then it is only fitting that we love. God is so loving that he gives us hope that we will not suffer and that he will make thinks ok, but we must believe and that is hard when you have a tragic un-expectant loss. I know that each day that you pray and ask God for help, each day he will give to you. He loves us all so very much and wants us happy so he will give you a added push daily. You are welcome Patti, to have a friend one must be a friend and you are one to me. You have given our family a precious great gifts in the form in little 4 legged spoiled brats (we love them) ;-). It's so good hearing your stories about Dustin and yes it is amazing the impact he had on people, I being one like I said only really knew him for a weekend and he was a wonderful careing person. I still heard little updates on him every once in while, Kenny had dated Tabitha which is one of the girls that went to Garner with us that weekend and well they still occasionally kept in touch after they broke up so I would get little "Baywatch" updates from her. You know like you said you will never know the reason God chose to take Dustin but I tell you I think your thoughts could be very true and hopefully when you are rejoined again you will know the reason and finally get that final peace as to why....I think you are an amazeing person and as many people have said Dustin got alot of his qualities from you. I think it's just one of those things when you meet a special person you know they are special and they make an impact on your life no matter how long or short you have known them. That is why I can only imagine the pain you and your family and Billy, and all of Dustin's friends are going thru. I love the way that you are shareing Dustin's life here on Earth and believe as you have said it is good for you and helps you to get by each day. I had been searching for some pictures that we took in garner that weekend and found one of Dustin today, I know one of my other friends said she had some too so I am going to try to get them together and email them to you if you would like. Well I hope you have a safe and happy New Years. Thanks for the compliment, My children/family are my world. It is amazing how you can love someone so much, I think that is why I am so touched by what you have gone thru and me knowing Dustin only if it was for a weekend but knowing how he was and knowing a mother's love for their children I can only imagine the hurt in your heart. But I think that it is great how you are useing your hurt and turning it into something positive because I do believe that God has a purpose for everything and maybe even if it is just one person that has read or even knew Dustin personally and saw how someone drinking and driving can destroy a life, and maybe they will think twice before driving or getting in the car with someone who has been drinking. I also can imagine all the questions that Dustin's wife has, it is hard when tradgic things happen when situations aren't at their best....But I am sure like you said and she knows in her heart that he died loveing her. Stuff like this makes you realize just how important it is to live each day like it was your last, which I believe from what I have read and seen that Dustin definantly Lived every day to the fullest because you don't have control, GOD is in Control and even though we don't always understand the why's there is a reason and he has a plan. I hope you have a Merry Christmas and I will continue to pray for you, your family, and all the people whose lives Dustin touched to have peace. You have so been on my heart and I pray for you. I love you so much!! Don't get in a hurry-- you are grieving someone you birthed out of your womb---a part of you is gone. I do not know that kind of pain, but I do know God knows that kind of pain because he watched his son die on a cross. we have to walk out the pain--thank the Lord we have the Holy Spirit!!!!! He is our comforter.. I pray that you receive the comfort the Holy Spirit is pouring out on you right now. May you receive the love the father is pouring out on you. God I pray that Patti would feel safe in your arms--that your grace would overwhelm her today. In the powerful name of Jesus! !